Oh hi there, I haven’t seen you since November. Recently I’ve been cleaning out my jewelry supplies. I even made a few things. If you want to buy them, you can check out my Etsy site. A haunting violin strain wavered through the Artisan’s mind as she woke up. A fragment of… what had she been dreaming? And then she realized – it was Lola’s birthday. She had no doubt where Glimmerville would take her today. Quickly she dressed and fed Brassica, then packed some currant scones, clotted cream, and raspberry leaf tea to take with her. And… but what would she give Lola, other than tea? 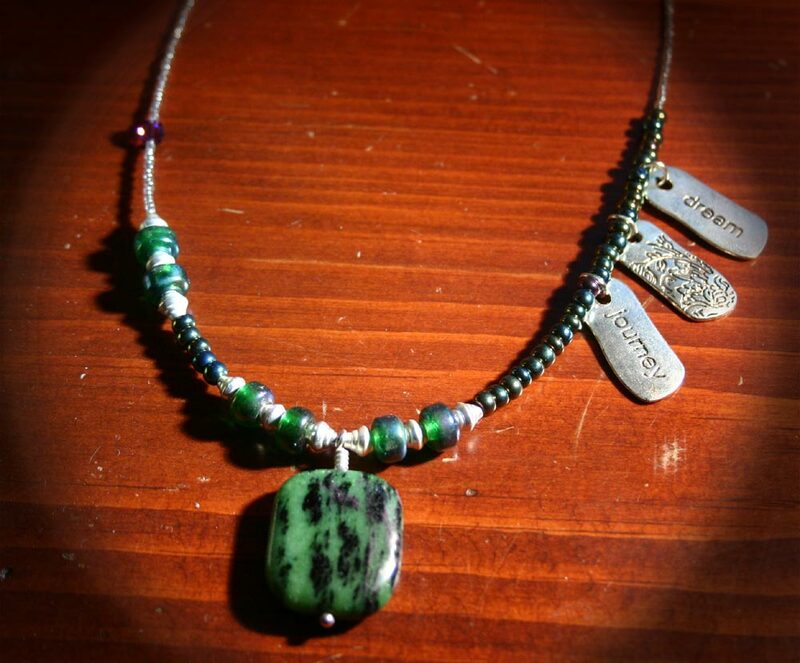 A necklace, of course, but what would suit a psion? Ruby, perhaps, for the fire… but some green should cool and balance it. 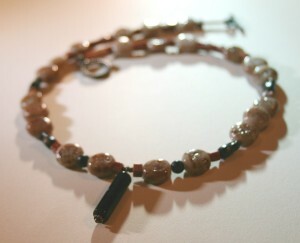 And then she had the perfect idea: Ruby in Zoisite, also known as Anyolite. The soft green matrix and black streaks complemented the dark purple of the ruby.. it was a swirling storm of creativity, and perfect for Lola. Now, it wasn’t often that she took serious stock in the lore and meaning of stones, but this was a beautiful exception as she recalled Lola loved the Zoisite’s vivid green. 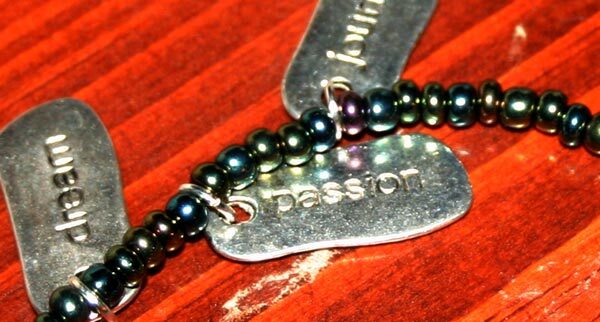 Quickly she paired the green stone with glass, and silver word charms for the ‘dream’ and the ‘journey’ of life. Then hid a little ‘passion’ in there – in case Lola wanted to bring out her wilder side. She took the tea, scones, and necklace, and placed them in a basket – then almost lost her footing as Brassica nudged her knees. “Aw, Brassy, you can’t come today – what would they think of a dragon in the middle of a modern city?” The waist-high yellow dragon huffed and lashed his tail, then turned orange in annoyance. The Artisan gave his ears a scritch and considered whether anyone would really notice a dragon. She knew few people paid attention to what they didn’t expect to see… come to think of it, that explained Glimmerville itself. It could only be found if you were the right person to find it. Well why not she mused. It’ll make life interesting…! “Ok Brassica, you can come too. This should be something,” she said, picturing Lola’s lavish mansion, with a young and curious dragon tearing around in it. Well they would likely take tea outside. She hoped. The Artisan unlocked her door, feeling the familiar shiver and twist as space rippled and rearranged itself around Glimmerville. She stepped out, with Brassica at her heels, and locked the door behind her. The door appeared, this time, in the side of a small outbuilding on the Corelli property – her worries about having a dragon downtown were without grounds. Lola was in the garden, on her way to greet them. It didn’t surprise the Artisan that she was expected – Lola was a woman, violinist, and psionicist of great talent and sensitivity. She surely had something to do with the dream of violin music. “Hello!” Lola called, and waved in greeting. She was wearing a loose calf-length black dress with a long strand of knotted pearls, and it fit her so well it made the Artisan wish she had chosen her own dress more carefully. “Hello, Lola! Happy Birthday! I was hoping we could have some tea,” the Artisan said, giving Lola an embrace, and the basket. “I already have a spot ready!” Lola smiled. “Outside, I hope.” She chuckled, and Brassica ran exhuberant circles around them both. “Ok,” said Lola, pausing to concentrate, hands at her temples. “You are getting an apprentice.” Lola said, with a strange authority. She opened her eyes. 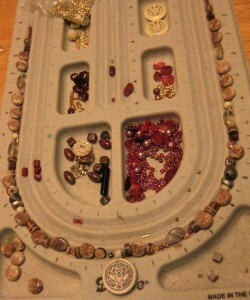 “Just send me things that you think I’d like – stones, shells, coins, scraps, anything. Mail them to the Artisan at Glimmerville. They’ll arrive.” She chuckled, pulling a starfish out of her hair, and leading the sea nymph to Glimmerville’s front shop door. The Artisan closed and locked the door, her job here complete, and with a sigh felt the water draining, the stone floor turning back to wood, her own gills vanishing. Glimmerville became whatever it was needed, when the doors were open. But once locked, it was her own shop again, and as familiar as her own daydreams. The Artisan warmed her (now dry) robes by the fire for a moment, glad at its return, then went down the hallway, to the library on the left. Strange she thought Is Glimmerville budding a new room? That hallway seemed longer than usual. What are you up to, old girl? She plucked a book from a shelf (with the passing, wistful thought that another library would be nice) and went back to her bedroom, happily remembering the joy on the nymph’s face, and wondering where they would end up next. In the morning she would unlock the door, onto sea or space, cave or sky, and see where they wound up next. They always ended up where they were needed, though sometimes with a few tweaks to fit the environment. She took it as a matter of course, and was more interested in what charmed necklace a dragon would want than what size the shop had to become to accomodate it in the front door. 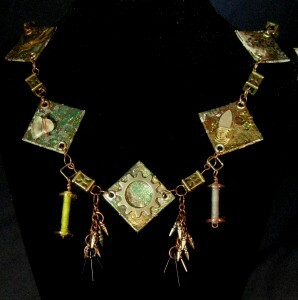 I have been intensely wanting to make jewelry lately, and had a necklace in mind. I had been intentionally collecting copper, green, yellow, pink and amber colored beads. 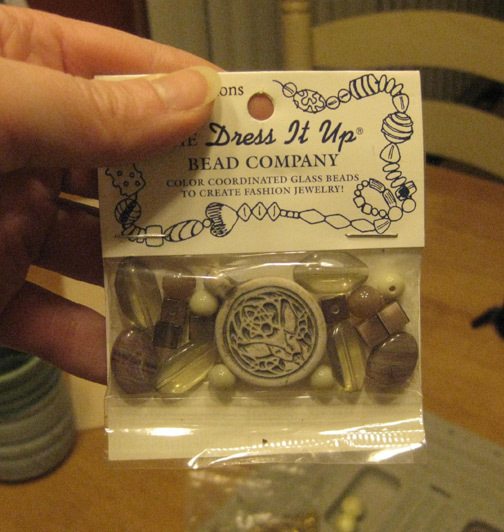 So I hauled out my current-favorite-mess-of-beads, and discovered a lone old packet of beads I had been completely avoiding. Note: I just sort of snapped photos as I went, so the lighting isn’t that great on these photos. I started to open them, then I realized this would make a fun blog – that’s why they are ripped at the top. Fun blog part being: I didn’t really plan or want to use these old beads, my goal is now to use them before the night is over! These beads are made of tan colored glass, with little lampworked dots of glass with coppery inclusions (much like goldstone). 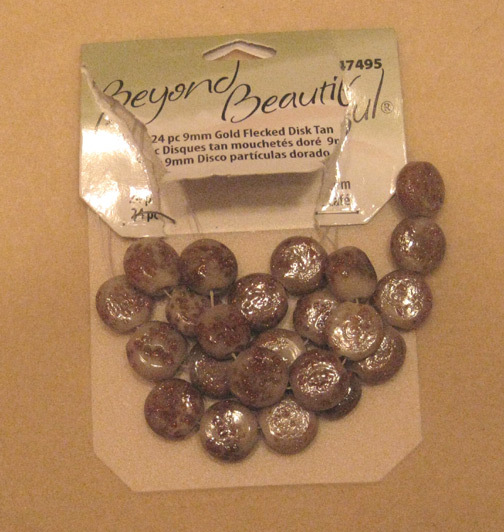 So my first idea was to look for more rustic neutral beads to add to them. I dug up this. Celtic knotwork is always lovely. Now effectively armed with a bunch of neutral beads, I put them together on my handy bead board and got this. It’s rustic, it has wood, painted wood, glass, a ceramic focal, copper…what more could you want? Well.. I don’t know, but I wanted something! It is a nice blending of neutral earthtones, and it just didn’t do it for me. I couldn’t feel anything from this pattern. Not that I don’t love that Celtic focal, but it wasn’t working here, for me. So I took it apart. 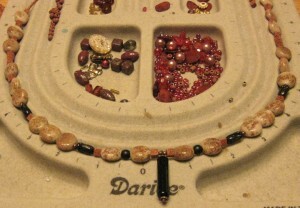 My second attempt began with the long black glass bead you can see in the middle of the bead board up there. I decided to go with one of my “standard” color schemes, really. Copper and black. I just like the drama you get when those colors play off against each other – they pop! 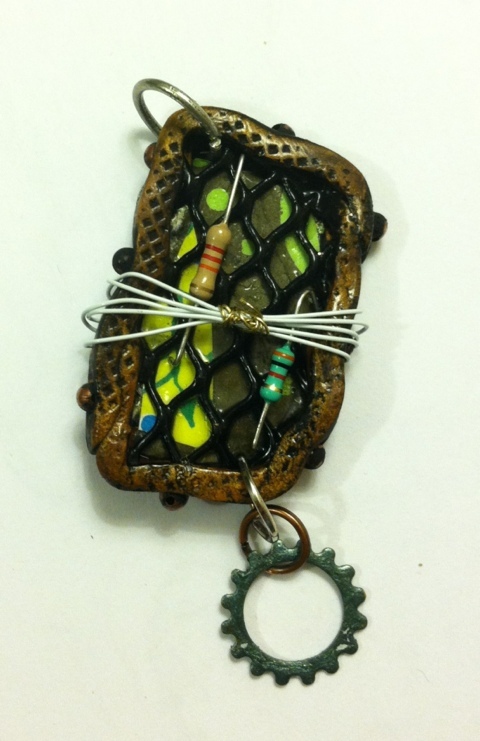 So here is what I ended up with next, and kept: black czech glass, goldstone squares, and those tan disks. That long black focal really draws the eye. Feel free to disagree with me, of course, but I like this design much better. I like the contrast on this one. Have you ever started a project over? I have done it on some much more frustrating projects (the time I burned a big clay sculpture comes to mind). But with beads, it’s forgiving: You can string and unstring and see what you get with various combinations! PS. 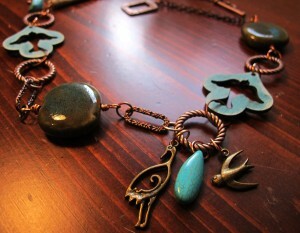 this necklace is on Etsy now. 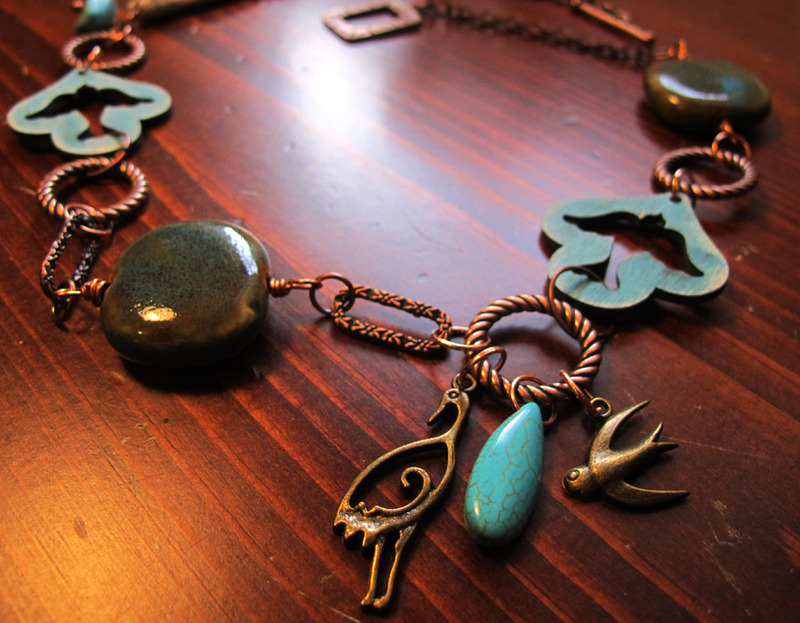 The necklace I started in the last post is “mostly done” – I say “mostly” because I didn’t actually figure out the best clasp yet. But I could take a photo of the front anyway!